A recent poll revealed that the Cincinnati Reds are baseball&apos;s 16th most popular team—yet their familiar "C" hat remains one of the top-selling fitteds. Why? We can think of a good reason, and it&apos;s got nada to do with Dusty Baker, Scott Rolen, and &apos;nem. Take a good look at the team&apos;s colorway: red. BLOOD red. Yup, Cincy&apos;s hat has become not only a favorite of "soo-woo" gang-bangers, but also for red-repping rappers like The Game and Lil Wayne. 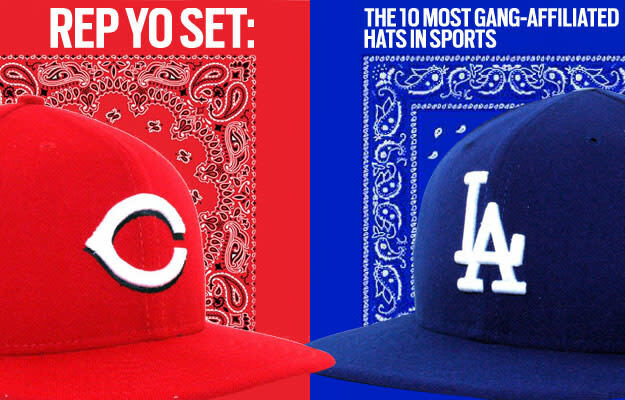 Of course, the Reds hat is only one of many sports caps with extra significance in gang culture. With that, we present to you the 10 most gang-affiliated hats in sports—and remember, be careful what fitted you rock in the hood, cuz!